This upright, fast growing deciduous shrub originated from Argentina and Uruguay, and has naturalized in sub-tropical areas of America. 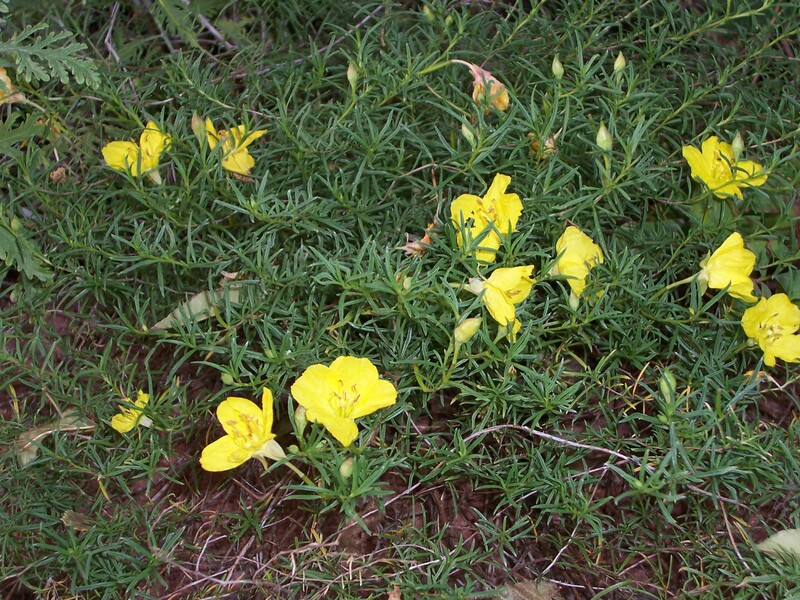 Clusters of bright yellow flowers with long red stamens are produced in the summer. Its natural growth habit is irregular and open, but pruning will encourage dense growth. Older plants may attain a height of 10 feet and nearly as wide. I’d use this plant as patio tree in small spaces, or as accent in a xeriscape design with other drought resistant plants. 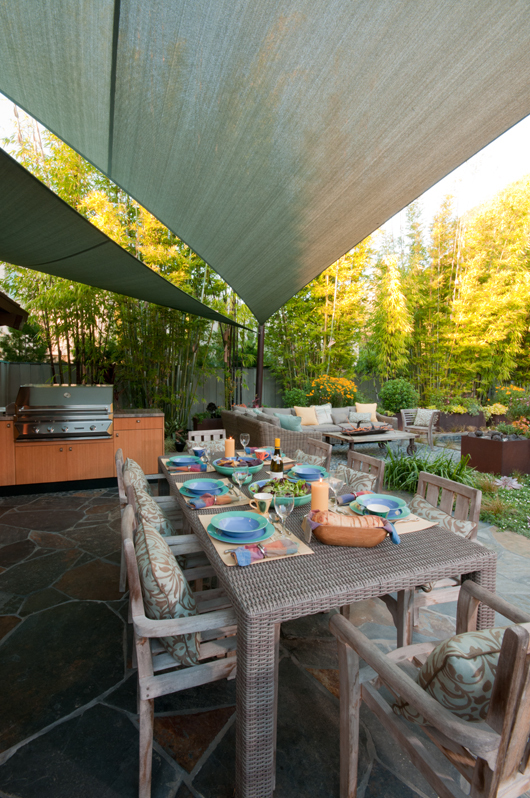 Its canopy would allow more delicate succulents such as Echeverias and Aeoniums to profit of its dappled shade; it could also be planted against a hot wall and soften it. Here’s another promising plant that caught my eye at the September meeting of the San Diego Horticultural Society: Adenanthos cuneatus ‘Coral’ Drift Flame Bush. “Adenanthos cuneatus ‘Coral Drift’ (Flame Bush) – A low-growing shrub to 2 to 4 feet tall by 3 to 5 feet wide with wedge-shaped silver-gray leaves that flush bright pink when in new growth and small red flowers with green at their base. The species is a common coastal plant along the south coast of Western Australia and this selection was made for its outstandingly bright pink new growth and compact low spreading habit. Plant in full sun in a well-drained soil. Drought tolerant once established. Though a coastal species, it has been grown in England since 1824 and is listed as hardy to winter temperatures – we speculate that it will likely prove hardy to at least 15 to 20 degrees F. A nice low plant for a rock garden or in a mixed mediterranean climate garden – very useful in beachside conditions.” Also described here as evergreen and deer tolerant. San Marcos Growers’ have a well-known track record of providing the most interesting, climate-adapted and diverse plants that are sturdy and long lasting, and that I can purchase at a local nursery. With its rounded form and medium size, I think it would echo the rounded form of the boulders in my garden and make an attractive companion to the more delicate succulents or ephemeral perennials in my garden. Can you imagine how pretty it could look as under-story shrub under the canopy of the Desert Bird of Paradise? Randy showed many more exciting drought resistant plants suitable to many different landscape styles, and I’ll continue to list them in my next blog post; keep looking out for it! The recent untimely heat wave is barely forgotten, but I‘m noticing the first signs that many of our water-wise plants have awakened from their summer beauty rest: Their green branch tips and new leaves are proof that they are actively growing again. With the cooler nights and fresh breezes announcing fall, my impatience is growing to be out in the garden; I’d want to be planting and trying out some of the exciting plants that I have noticed in the recent months and that I could barely stop myself from buying. 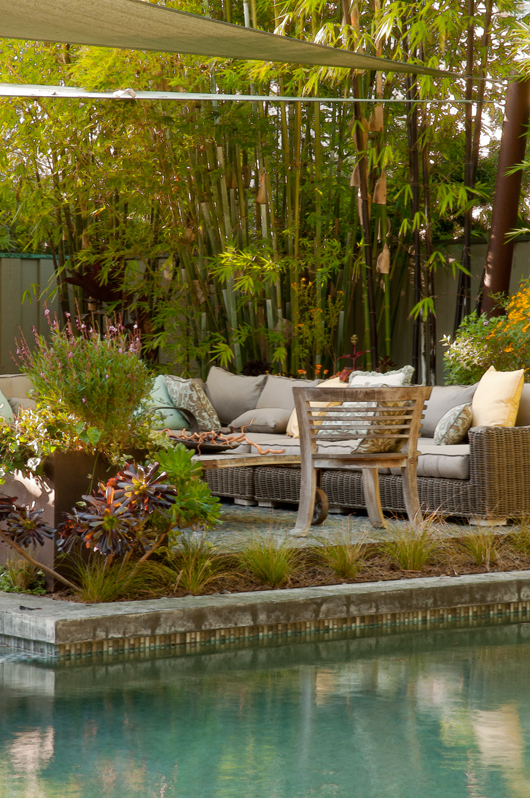 The gardeners among us know that there’s always room in our gardens to improve and tweak, to improvise and create, or to replace those plants that have proven to be not so sturdy or are otherwise unsatisfactory. This provides us with a welcome excuse to compile our wish list, research these plants and see which ones we’ll fall for this year! With plant sales happening now and some great growers offering their new releases, it would be easy to get carried away and come home with trunks full of exciting plants. I have done this myself and given in to plant cravings that I later regretted: A garden that is a collection of plants can look really disjointed, and I have come to prefer a garden that shows a theme and some continuity, and repetition of colors and textures does make for more soothing calm. So with the following list I hope to highlight a few of the plants that make me drool. 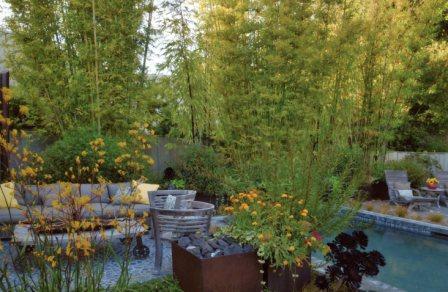 Besides drawing from my own notes, I have asked a couple of landscape designer friends to share their favorites. All these plants have many wonderful attributes in common: They are xeriphytes from all over the world that share many desirable attributes: They are drought resistant plants (also marketed as “waterwise plants”), hardy, with a good structure and undemanding in maintenance (that includes fertilizer and pruning) and provide year-round interest. ‘Rio Braco’ Texas Ranger is a fast growing, dense screen shrub that needs no pruning after the initial shaping to become established. At maturity it reaches 5 ft ht x 5 ft wide. This is a drought tolerant shrub that only requires a once a month deep watering in the summer months once it is established. 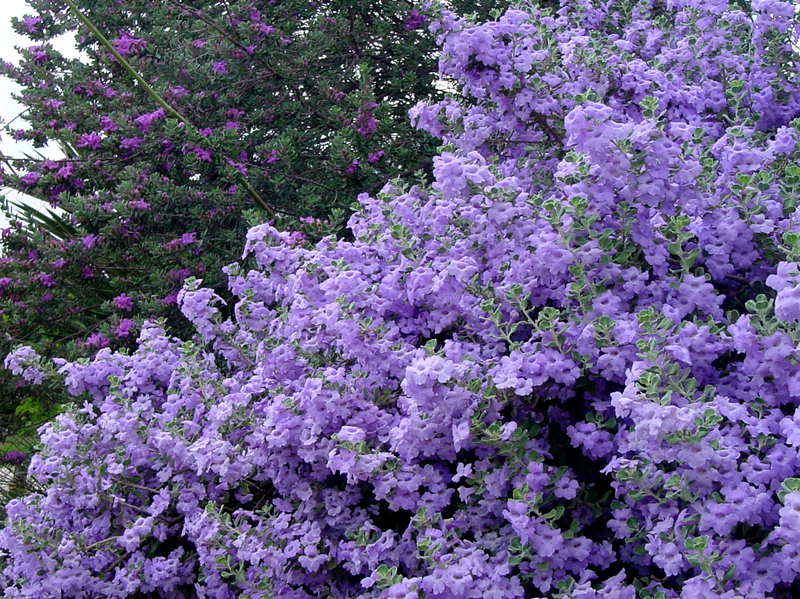 The lovely lavender flowers cover the shrub in intermittent waves during the hot humid months of summer and fall. [In my experience in dry summers, the flowers are more sparse.] The evergreen foliage is a soft mint green all year long. I like to use this plant as a dry garden border, a screening shrub and a colorful focal accent. This is my favorite fall color plant. It is great as a screen on fencing. It takes moderate water and can even handle regular water if in an area that receives more. It is best in full sun and can handle partial shade. A deciduous native plant that has edible fruit and climbs by tendrils. Has gray-green leaf color all summer and then turns brilliant red in fall. Rosemary ‘Roman Beauty’, dwarf to 2’, they say, and grows in an upright, roundish form that is consistent and easy to keep in place. It also has a more graceful appearance and a bit of a different color than the usual look. A compact and slow growing semi-upright Rosemary with slightly arching stems bearing narrow mid-green leaves and violet-blue flowers in late winter and spring. This plant will likely get somewhat larger but 2 year old plants only measured 16 inches tall by 12 inches wide. Plant in full sun. As with other Rosemary it is resistant to deer and rabbit predation, tolerant to salt spray, alkaline soils and drought. Hardy to 15°F. This shrublet could add that “needle-like” element that coniferous plants introduce (great contrast to a rounder, fleshier foliage), or allude to a classic Mediterranean landscape. I’d use it as an important connector and “glue” that, frequently repeated, can hold all your other plants together. (See my previous post about the role of shrubs: Better Beds with Shrubs). Please keep an eye out for my follow-up post where I share more exciting plants that promise to make a great show in your gardens next year. 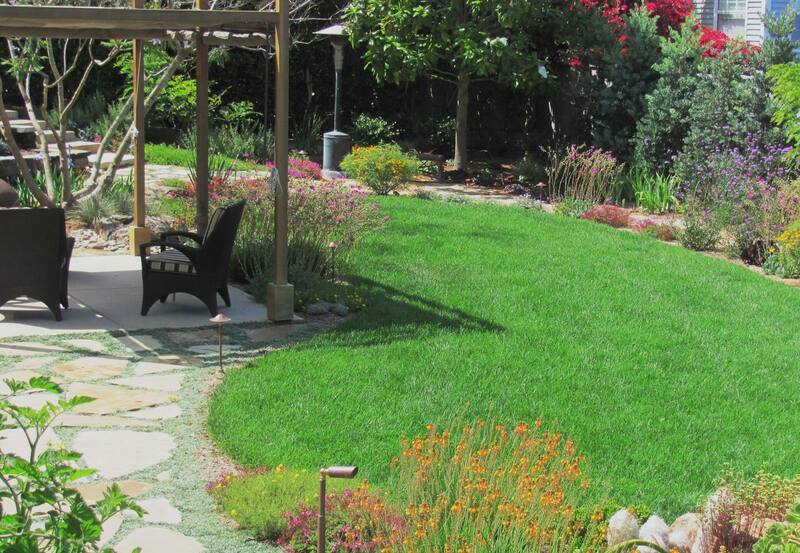 Also: Next month, October 13, at the monthly meeting of the San Diego Horticultural Society I’ll be one of three landscape designers giving a presentation about design options for those who are considering removing their lawn. 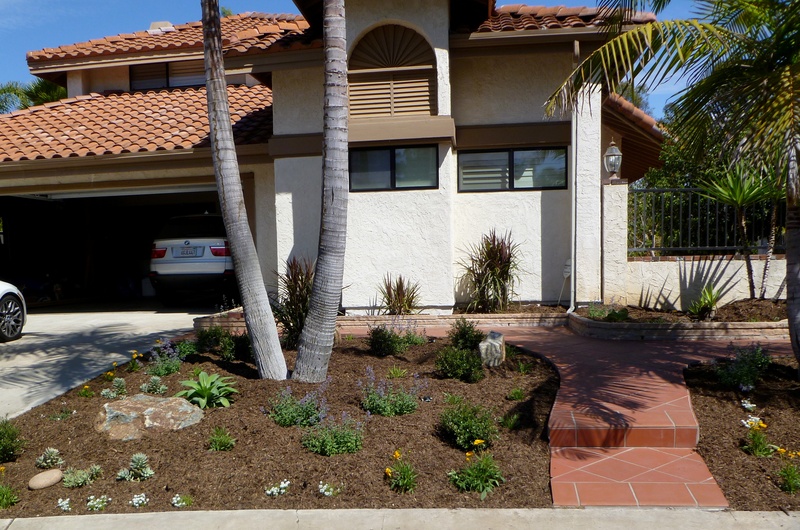 This drought resistant landscaping – front and back – is lovingly planted with exuberant, dramatic greenery that is a pleasure to care for. 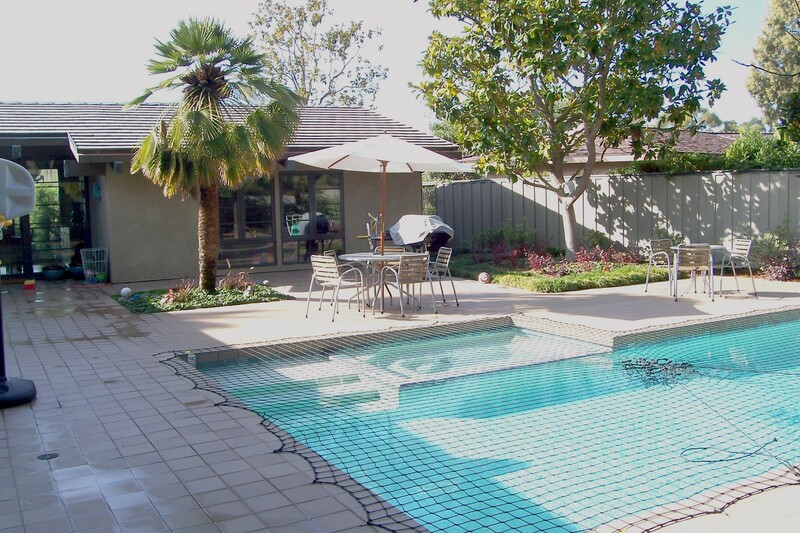 Shady sitting areas, water play features for children and adults, and comfortable walkways made from beautiful materials invite year-round outdoor enjoyment. 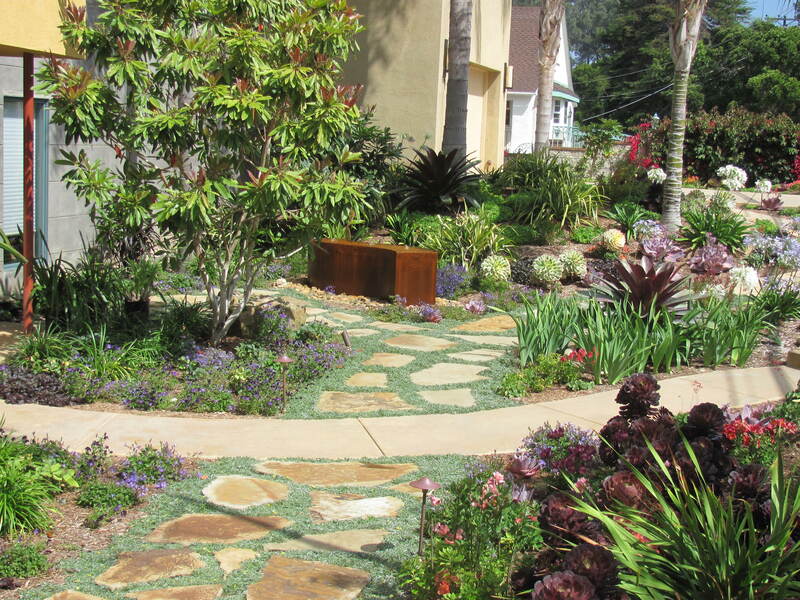 A stunning example of xeriscape design in San Diego. 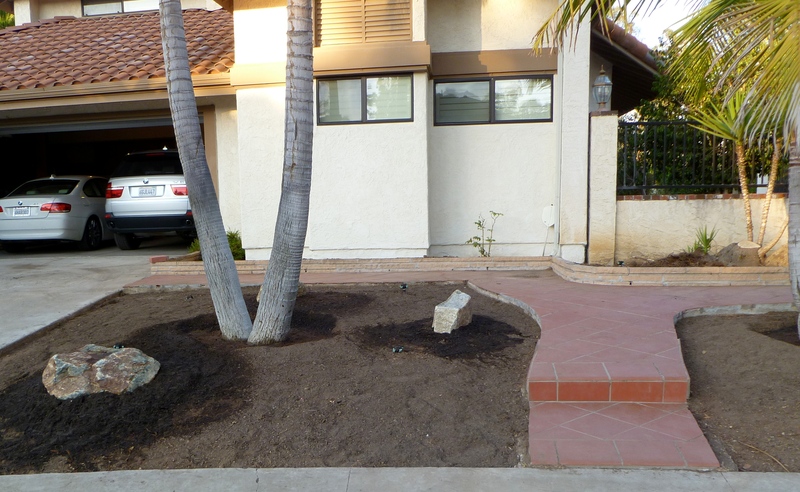 BEFORE: The front yard landscape design was a plant jumble that obscured the entrance to this modern home and darkened the front yard. 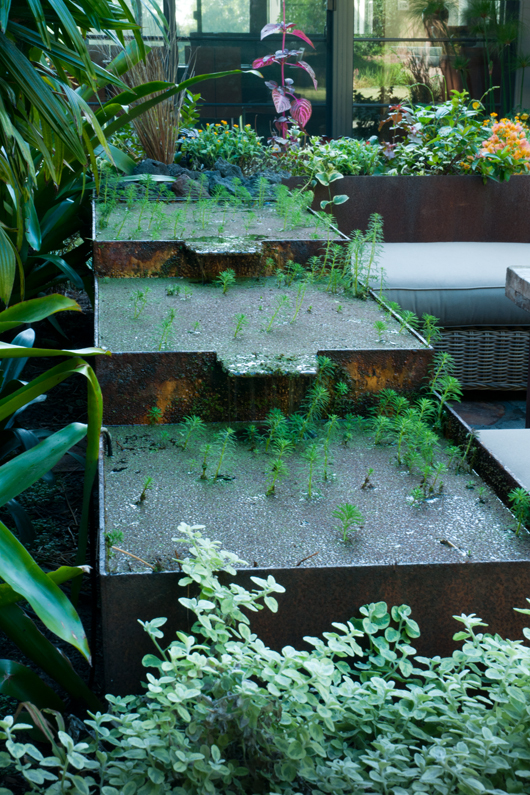 WANTED: The homeowners desired a low water landscape with low maintenance plants; in addition, these gardens should provide year-round gardening pleasure with plants sculptural and bold enough to hold their own against the striking architecture of the home. From the existing planting scheme we kept the palm trees as accents and overhead canopy. To this we added terrestrial Bromeliads, Echeverias, Aeoniums and Agaves selected for their dramatic foliage, easy care and permanent allure. A large Aloe bainesii, Bronze Loquats, Leucadendrons “Safari Sunset” and an exotic Trevisia palmata add weight in the mid-plane of the composition. The flower bed designs show a plant combination that works well: The Leucadendrons, Aechmeas and Vrieseas will need watering every 10 days or thereabouts (this of course after the establishment period). They’ll make good companions to the Agaves, Echeverias, Sedums and Coral Bells. 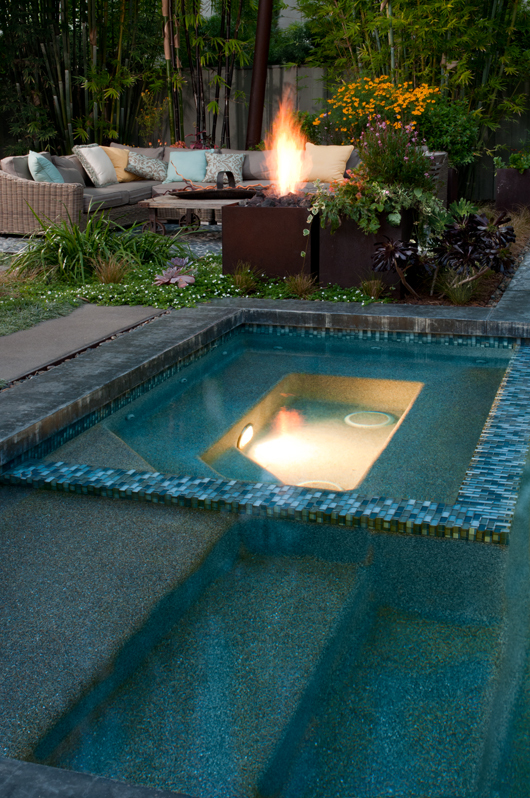 A sleek re-circulating fountain stands across from the window and can be viewed from inside. 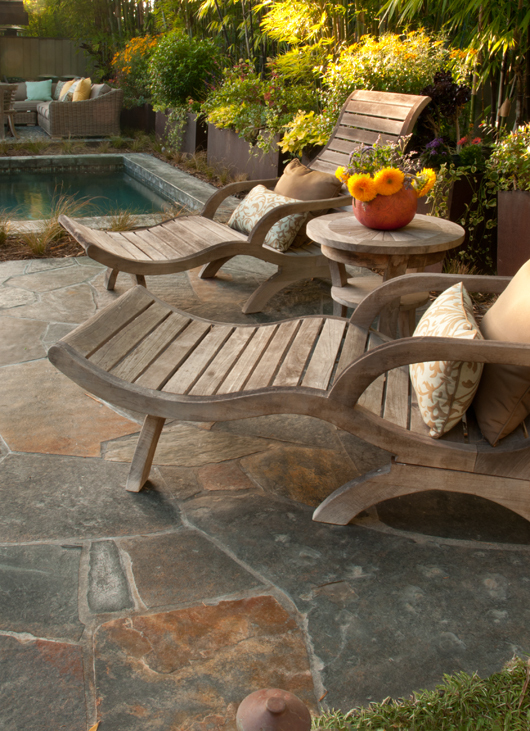 A flat-topped boulder and a chair nearby invite to sit and watch the grandchildren play with the water. 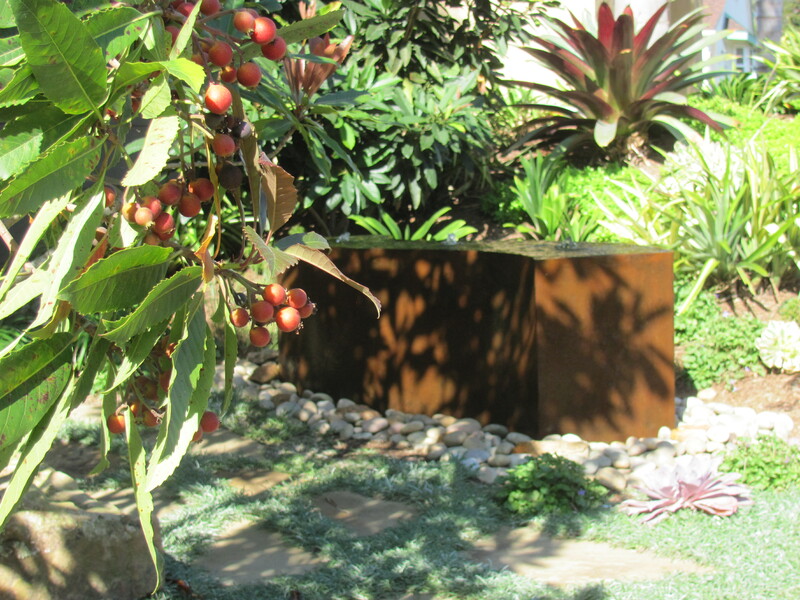 This fountain was fabricated from naturally rusted cor-ten steel. Water is pumped up from a subterranean reservoir into the fountain trough and sheets over its sides. 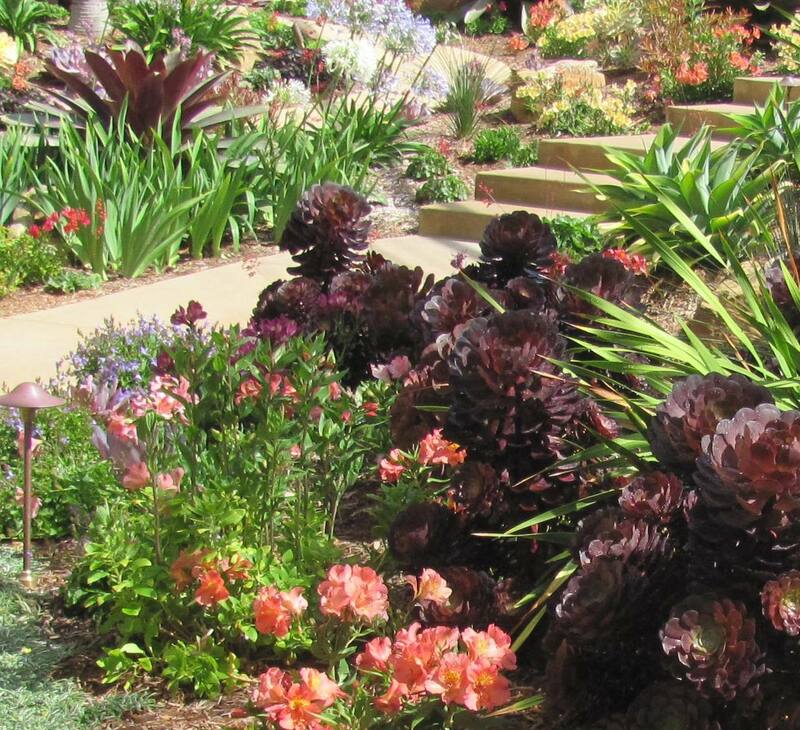 Although Peruvian Lilies and Iris provide a lot of color in the summer months, most of the visual interest is provided by the permanent textures and colors of foliage plants, as here by the Black Moon Aeonium, variegated Foxtail Agave, Dymondia Silver Carpet and Sedum kimnachii, all very fine drought xeriscape plants. A flagstone path bisects the front garden, connecting the driveway to the front door and continuing around the house to the back garden. It allows viewing and exploring from all angles and increases the enjoyment of so many fascinating plants. 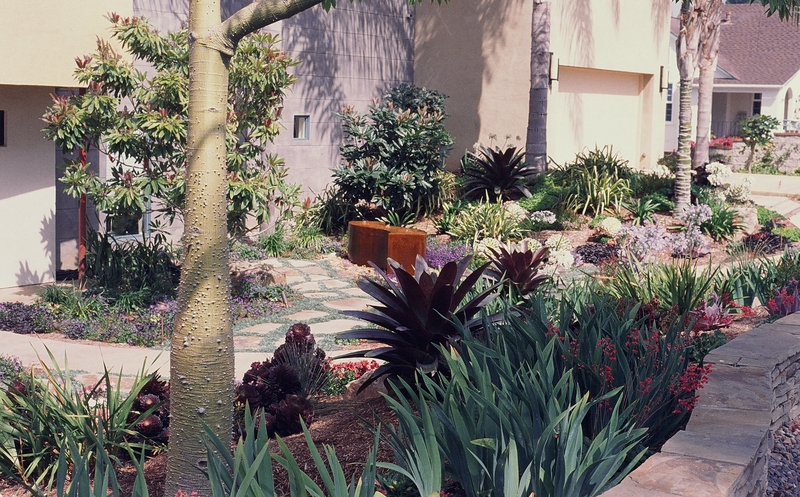 This xeriscape design in San Diego has become a garden with generous and exuberant greenery; there is just enough lawn for grandchildren and dog to play on. 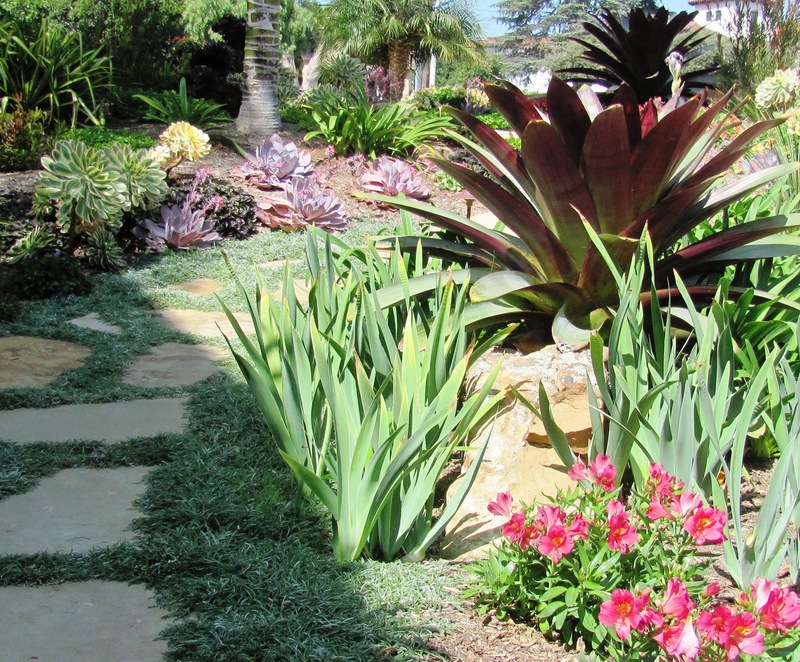 A beautiful flagstone path invites strolling past Mexican Marigolds, ornamental grasses, Rock Purslane, Sundrops and Brazilian Coppertree, to name a few. 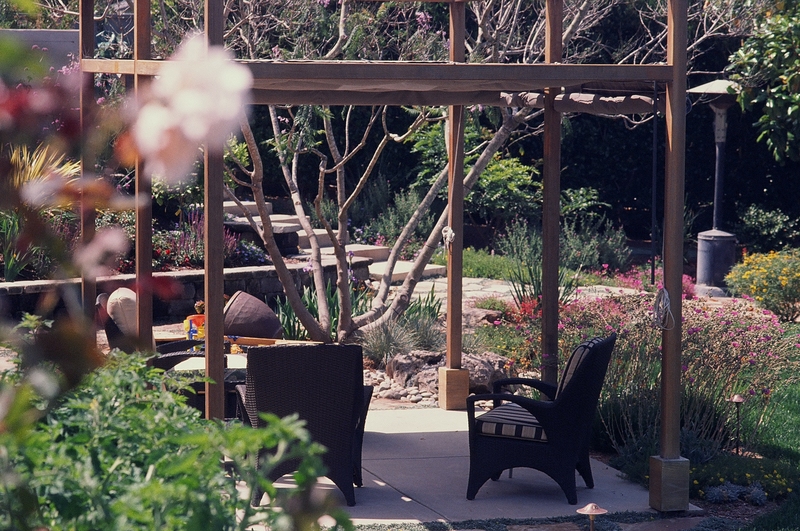 The sandbox was placed under the Jacaranda right next to the pergola, and a “splashing boulder” adds another attraction for children and adults. Now parents and children can enjoy their playtime in the comfort of these shady places. The raised beds are holding Roses, Lavender, ornamental grasses and Irises of “her” collection as well as vegetables planted at their feet. With careful placement and their own irrigation cycle no plant interferes with another, and all are doing well. Fantastic succulents and cacti evoke a world of other-worldly marine creatures that was inspired by the “sea-scape” created at San Diego Botanic Garden by Jeff Moore, Owner of Solana Succulents. Red Octopus Aloe, Myers Asparagus Fern, Star Fish Aloe and Medusa Plant were set into two earthen mounds decorated with scree, lava rock and boulders to evoke a coral world populated with sea weeds, anemones and star fishes. 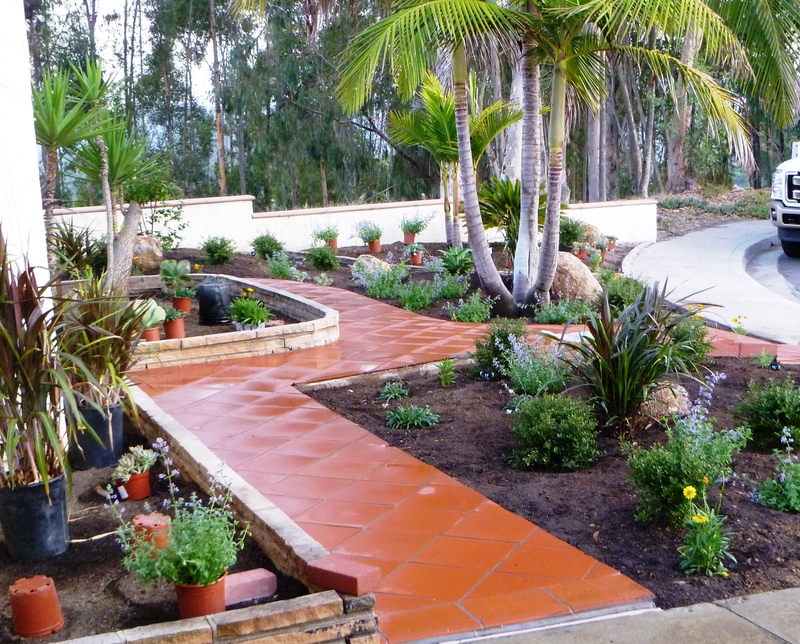 Partners in this project: Mark Sterk of Columbine Landscape, Escondido, CA, one of the finest landscaping companies in San Diego, executed this project with a never-tiring attention to detail, creative problem solving and absolute dedication to quality performance. 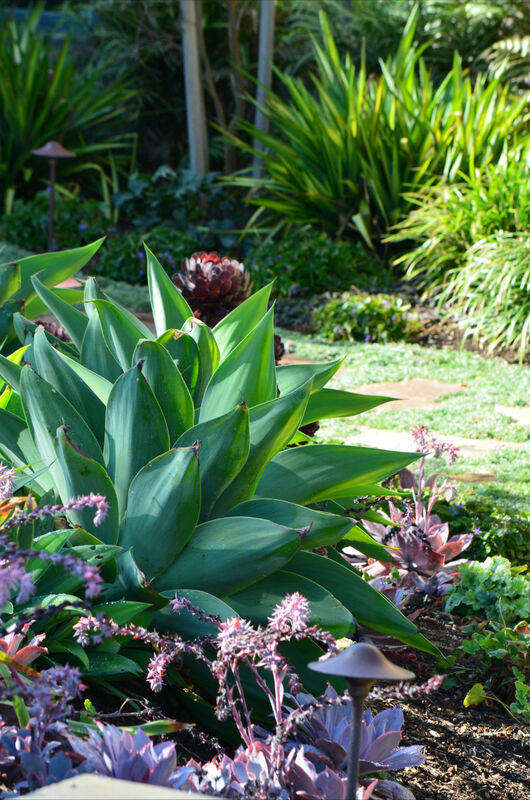 Rancho Soledad Nursery, Rancho Santa Fe, CA provided the “exotics” (Vrieseas, Aechmeas, Agaves, Echeverias). Green Meadow Growers in Bonsall, CA provided perennials and succulents. Solana Succulents provided the plants for the “sea scapes”. 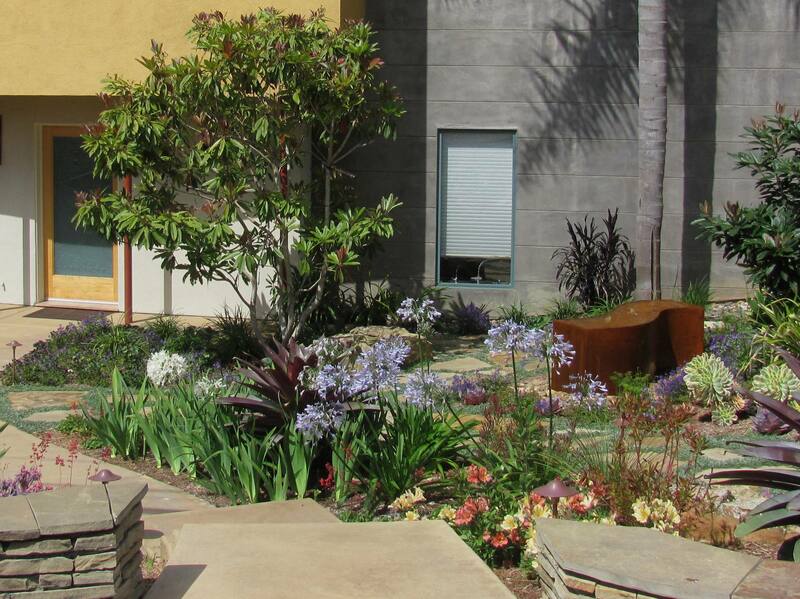 This is truly a breath taking example of xeriscape in San Diego. 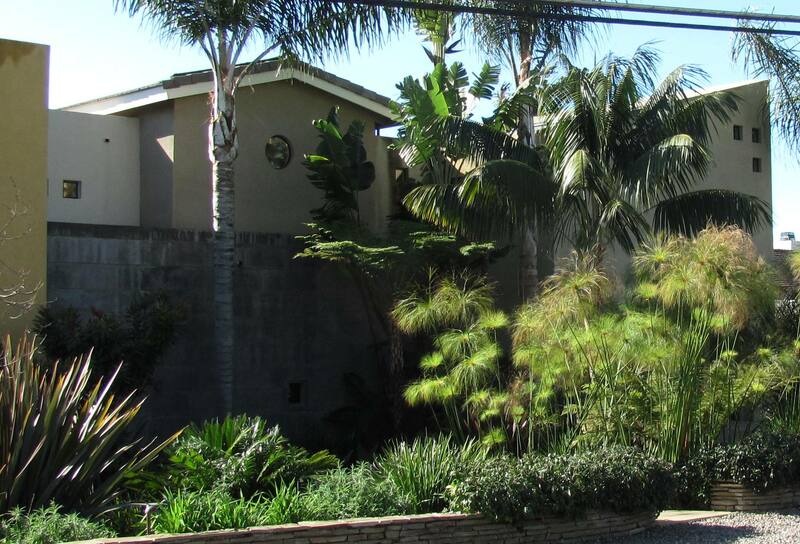 Congratulations to Jeanie and Lee in Scripps Ranch, for their resolve and their love of plants. 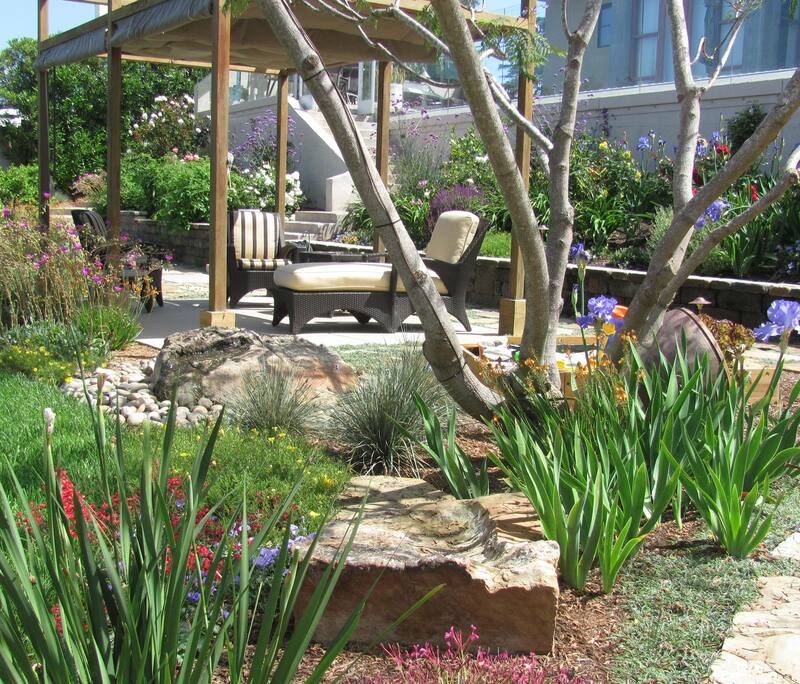 Going from a lawn-centered “zero-scape” to a garden alive with xeriscape plants with beautiful colors and textures, and doing this with their own landscape ideas and muscle power demands respect. 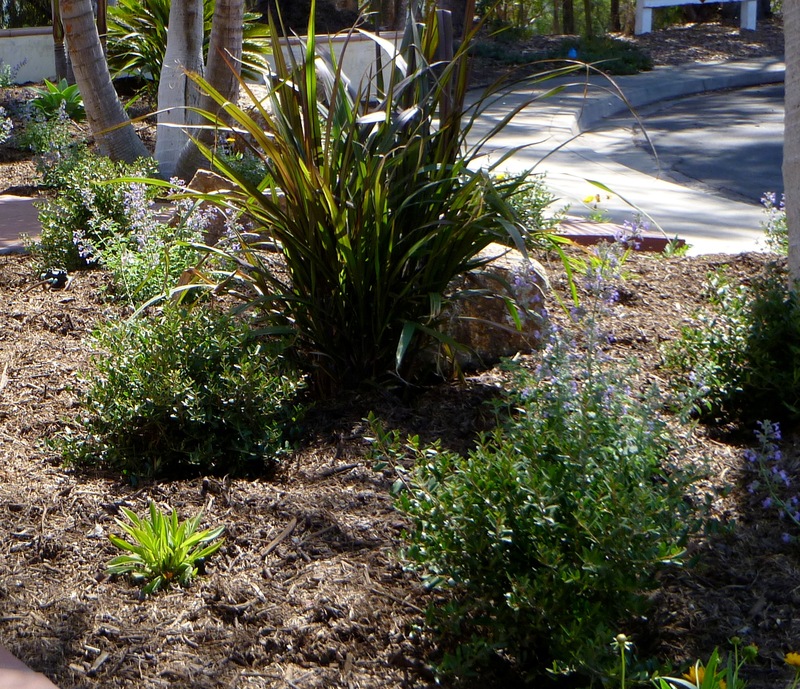 Hoping to qualify for San Diego’s rebates for turfgrass removal and the installation of a micro-irrigation system, they discussed the how-to with a City inspector and put a design together. Here’s where Jeanie called me in to review her design and desired plants. Assessing soil, micro-climate and the slightly sloping terrain I found that her wish list had excellent “bones” in it that needed few adjustments. The permanent features to remain were the concrete turf edge, the edged planter beds and the palm trees (they would have their own irrigation). I recommended importing several large boulders which would help “ground” the landscape. To add volume where the palm trees are only accents I suggested a couple of small trees, on both sides of the house; here Jeanie chose 2 ‘Catawba’ Crape Myrtles, one of them a multi-trunk specimen. 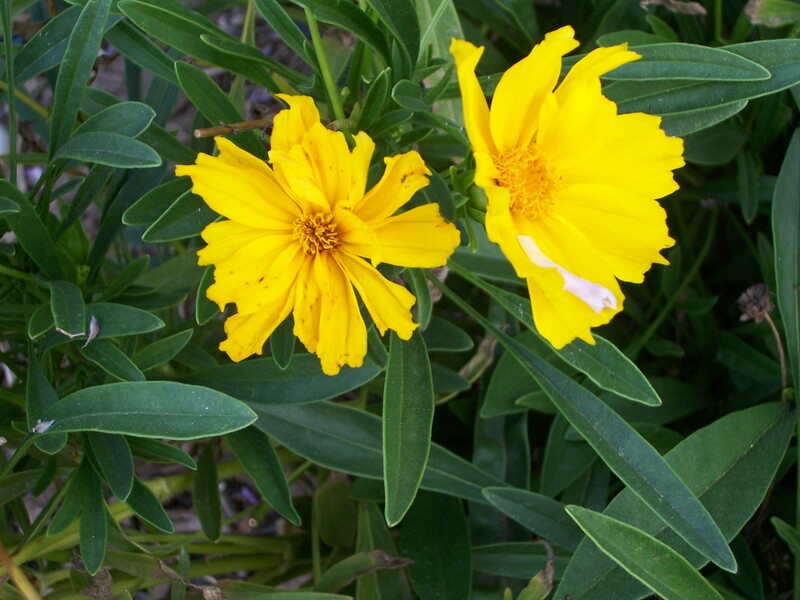 As we were fine-tuning her design and discussed longer-blooming low maintenance plants, Jeanie said that she likes to garden and is not averse to some maintenance, such as deadheading the Early Sunrise Coreopsis periodically to encourage new bloom. I explained that Gazania would not be attractive long enough during the seasons. Instead I suggested Ghost Plant Graptopetalum paraguayense, an elegant, slowly spreading succulent whose grey-pinkish rosettes would make a pleasing connection with Coreopsis, Walker’s Low Catmint and Gaura, all on Jeanie’s list of favorites. For a captivating contrast to the frilly perennials we added several Foxtail Agave A. attenuata and ornamental grasses; for me the grasses are matchless in adding a relaxed and naturalistic, almost mysterious feeling to the landscape. Here Jeanie picked a short Purple Fountain-grass variety in a local nursery. Complimenting the drought resistant plants would be a Dwarf Yaupon Ilex vomitoria ‘Nana’ that I hadn’t used myself. My research showed that it might need a bit more water than the other plants, but Jeanie wanted to give it a try. This shrub, at 3-5 ft high/wide, develops a refined, attractive appearance with careful pruning – a task that she looks forward to. Our first winter rains have blown through and and brought a welcome refreshment after the long and hot months. As our summer bloomers are going into their winter rest, much of our traditional drought resistant landscaping is beginning to look a bit drab (unless you have one of those ever-bloomers such as Bougainvillea). The approaching holidays are creating an atmosphere of hope and expectation, and when we add to this the notion that this is an ideal time for planting in the low water landscape, we find ourselves searching the garden centers for the colorful plants that can cheer up our winter gardens. However, you’ll notice that most nurseries reserve the bulk of their space for the big sellers: Poinsettias, green wreaths, Camellias and Azaleas of course, and many winter blooming annuals. 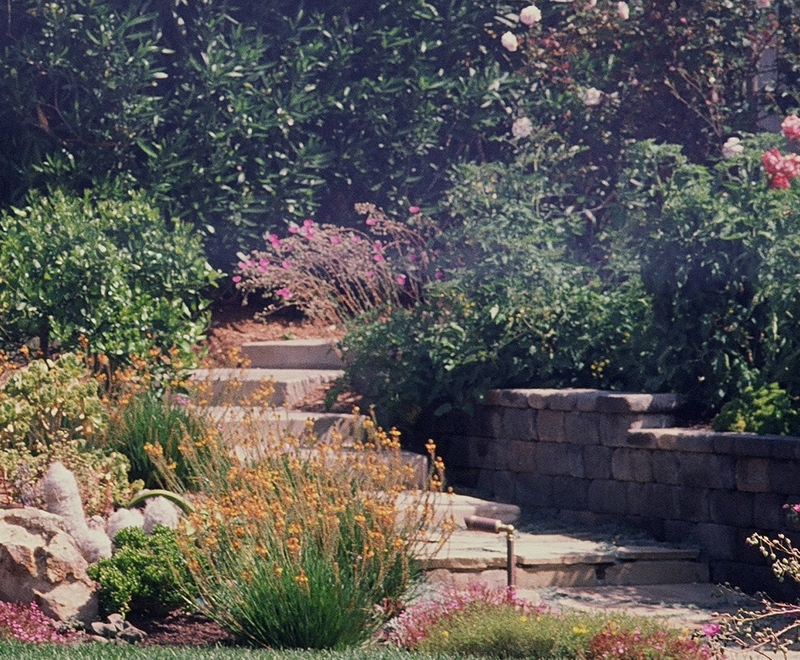 If you are more interested in exceptional xeriscape plants that don’t have to be replaced at every change of the season, that will flower through the winter months and that will add color to your garden for many years to come, read on. From the many that come to mind I have chosen a few that are un-demanding in maintenance, low in watering needs, and just outstanding plants. This list is just a first selection, and I’ll be happy to share many more with you if you contact me. Santa Barbara Daisy Erigeron karvinskianus, is a free-blooming perennial with dainty, white/pink daisy-like flowers to ¼ inch wide and narrow leaves to 1 inch long, that gracefully trails and slowly spreads to about 3 ft with a height of 10 to 20 inches. It’s not really a winter bloomer as it has already been in bloom all summer long, but the flowers never stop coming. 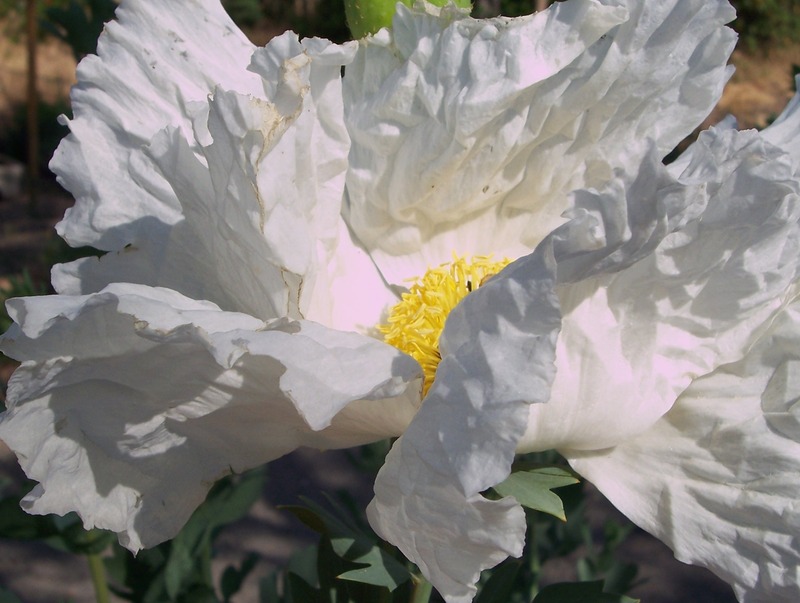 It likes full sun but can tolerate partial shade and is very drought tolerant. It can be a bit invasive but is not overwhelming. 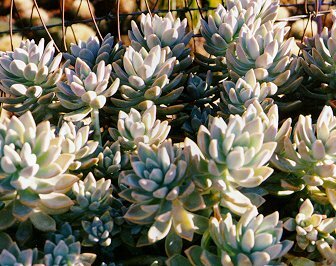 Use it for edgings, as groundcover, in containers and in rock gardens, in naturalized beds, hanging baskets or in dry laid walls, especially to offset plants with a coarser texture, such as fleshy Ghost Plant (see it described in “‘The “work horses” in my drought resistant landscaping”). These closely related perennials grow to about 1 ft high by 2 ft wide. Although not true winter bloomers, they will, if planted in a sheltered spot, continue their bloom from summer to winter, although a little more sparsely. I love them because they are long flowering must-haves for the xeriscape, undemanding in maintenance. Sheer them down to a few inches in mid spring to give them a rest and tidy them up for the next flowering season. 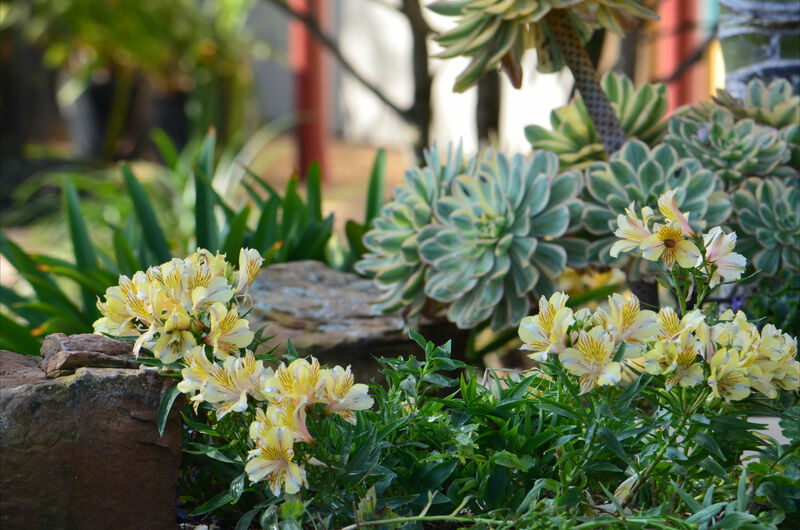 Their brightly yellow flowers will cheer up many drab spots in your garden, in full sun or light shade, and their fine textured foliage is an excellent companion to coarser textured succulents. Baja Fairy Duster Calliandra californica: This native to Baja California and Sonora, Mexico, is an evergreen shrub with an open growth that can reach 5 ft to 5-6 f wide. 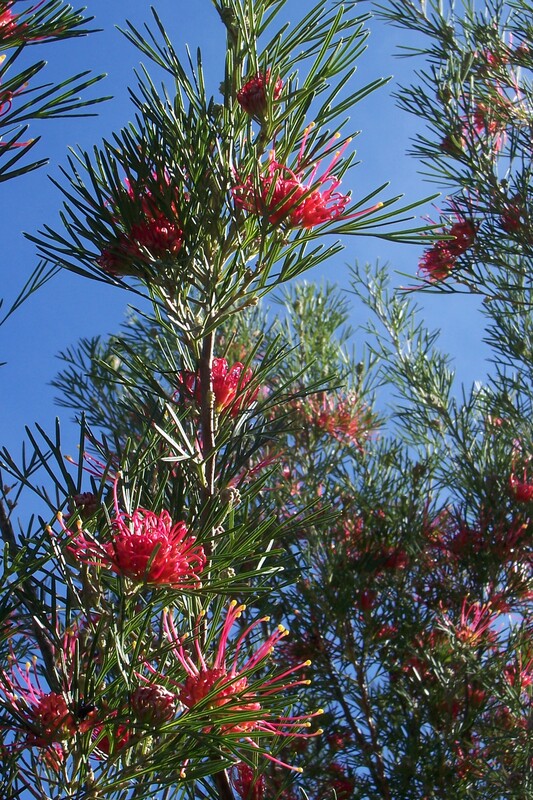 This species is sometimes compared to Fairy Duster Calliandra eriopylla, which is smaller (to 3 ft x 3-4 ft wide), summer deciduous to evergreen, with less luxuriant foliage. There is also a hybrid available called ‘Maricopa Red’. These sturdy yet fine-textured shrubs like hot dry situations, although the Fairy Duster C. eriophylla can also tolerate the warmer coastal environments. They all like the full sun and need good drainage. With little to moderate water the Baja Fairy Duster C. californica and its cousin ‘Maricopa Red’ bloom year round; Fairy Duster C. eriophylla starts in late winter and goes into early summer, but leaves and bloom last longer if some summer water is given (the Fairy Duster is summer-deciduous). All produce the characteristic exotic duster-like flowers that are puff balls of deep red or light to deep pink stamens (C. Eriophylla) ½ to ¾ inch in size that are irresistible to hummingbirds. Baja Fairy Dusters C. californica produce flattened seed pods 2-3 inches long and dark brown; those of Fairy Duster C. eriophylla are quite attractive: to about 2 inches long, brown with red margins and a fuzzy coating that catches the sunlight. This one can be used for erosion control as it spreads by rhizomes. These shrubs work well in the low water landscape as accent or massed as groundcovers (especially the smaller C. eriophylla). Try setting off their fine textured foliage next to more sturdy succulents or cacti to lend them a softening effect; The Fairy Duster C. eriophylla also makes a great specimen in a glazed container. Feathery Cassia (also called “Old Man Senna”) Senna artemisioides (sometimes sold as Cassia artemisoides). This Native to Australia has silvery-grey, needle-like foliage and is 3 to 5 ft tall and wide with an airy open structure. It can take full sun or partial shade and likes well draining soil. Beginning in late fall, it covers itself with a profusion of yellow ¾ inch clusters of 5 to 8 flowers puff balls of flowers that can continue into early summer when the shrub takes a rest, to start again in late fall. Its reddish-brown flattened, 1½ inch long narrow seedpods hang on for a long period of time, but in the heat of summer this provides an attractive contrast to the silvery foliage. 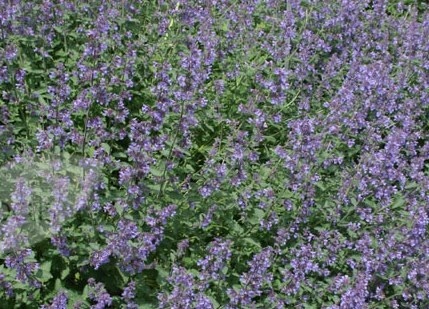 It is very drought tolerant but looks best with moderate to regular water. Grevilleas are evergreen shrubs and trees most of which come to us from Australia. Of the many that we can grow in our County this one displays an open, graceful growth and can reach 8 ft tall by 12 ft wide. Its needle-like, deep green 1 inch long leaves are almost white beneath. The shrub produces clusters of orange-red flowers in winter and spring and intermittently at other times. It needs full sun or partial shade and little or no water. As a spectacular screening or specimen shrub it will mask unsightly views or provide privacy. The Aloes are primarily South African natives that range in size from 6 inch to tree-like, but all form rosettes of fleshy, pointed leaves. To me, this is the most striking and imposing Aloe as it forms a large, rounded shrub-colony that over the years can reach 10 ft high and wide. Branching stems carry big clumps of grey-green, spiny-edged leaves. Is is easy to grow in well-drained soil, can take full sun or shade and salt spray, needs little water but can take more. This makes them nice companions to perennials that have similar water- and drainage needs. Its foliage can be damaged at 27 F but will in most cases rebound. In winter, this plant produces spiky torch-like clusters of bright brick-red flowers. A variegated form is also available. This south African native can quickly reach 2 ft tall, about 2 ft wide. Its fleshy paddle leaves may be green edged with red or whitish-gray, depending on variety; its sports drooping orange-red bell-shaped flowers from late fall into spring. This succulent is suitable for the drought resistant landscaping and needs excellent drainage. Tolerant of light frosts, it is easy to propagate from cuttings and makes a great container plant. Pearl Acacia (also called Queensland Silver Wattle) Acacia podalyriifolia. Native to Australia, Mexico or the southwestern US, many attractive, winter-blooming and fragrant Acacias are available to us. The evergreen Pearl Acacia grows to 10-20 ft tall and 12-15’ wide with roundish, 1 1/2 inch long silvery gray satiny leaves. It is a shrubby plant that can be trained into a small tree. Brilliant bright yellow puffy and sweetly fragrant flowers are produced in late winter/early spring. It is tolerant of our soils and needs full sun little or no water. The Sunset Western Garden Book recommends to prune the Acacias that are grown as tree form to open up their interiors which will reduce dieback of shaded branches. This is a fast growing evergreen shrub that can be easily be trained into a small tree. It grows 10-25 ft tall and 6-10 ft wide. Especially as a multi-trunked plant it can make a beautiful specimen for the low water landscape. Its glossy green leaves are about 2 inch long on broadly arching branches that may or may not have spines. Pretty ½ inch sized violet-blue flowers in fragrant clusters are produced nearly all year and attract people, butterflies and hummingbirds. They are followed by pretty yellow berries (toxic if ingested). 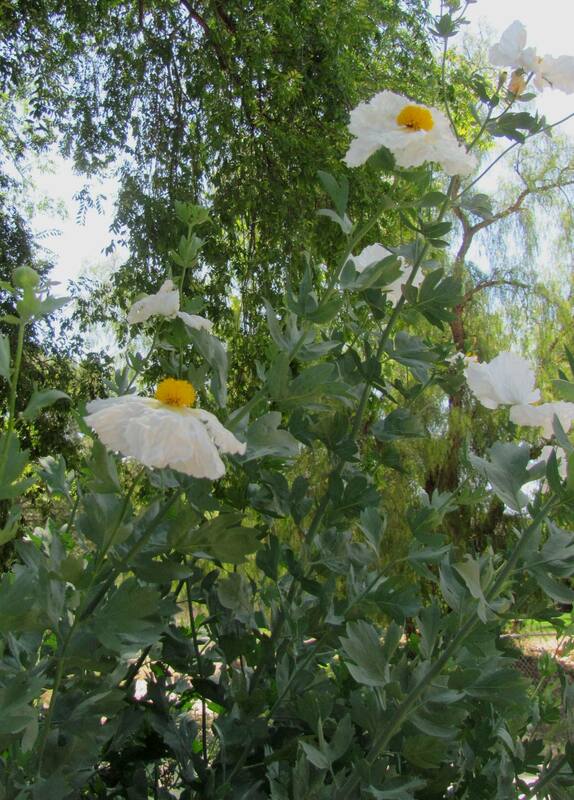 It grows easily in most soils in full sun or partial shade, needs only average watering and tolerates temperatures down to around 20 F.
There are also light-blue and dark-blue flowered selections of this shrub available, as well as a white one called ‘Alba’. ‘Sweet Memory’ is thornless, with flower petals edged in white. ‘Gold Mound’ is a small one, only 1 ½ ft wide and high, has brilliant gold leaves and flowers rarely, but it is excellent for adding color to container plantings. Waterwise Botanicals a few miles north of Escondido grow exceptional xeriscape plants, including perennials, shrubs, succulents, cacti and roses. Their availability list with photos and plant descriptions is online. 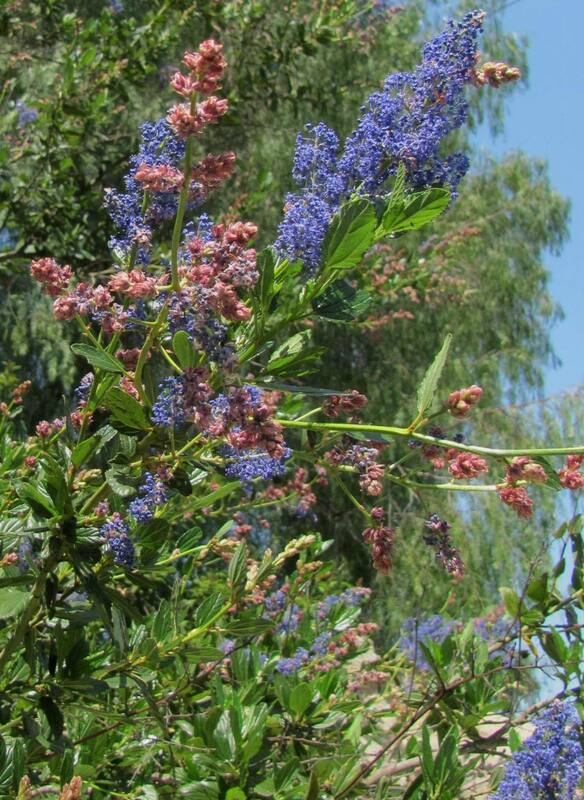 Briggs Tree Company in Vista carries a wide variety of traditional landscape as well as drought resistant plants, and their list (most plants now with descriptions) is available online. Green Meadow Growers in Bonsall also offer a great line of grasses and succulents as well as shrubs and perennials; they also make available plants from Mountain States Wholesale Nurseries who specialize in desert plant species. 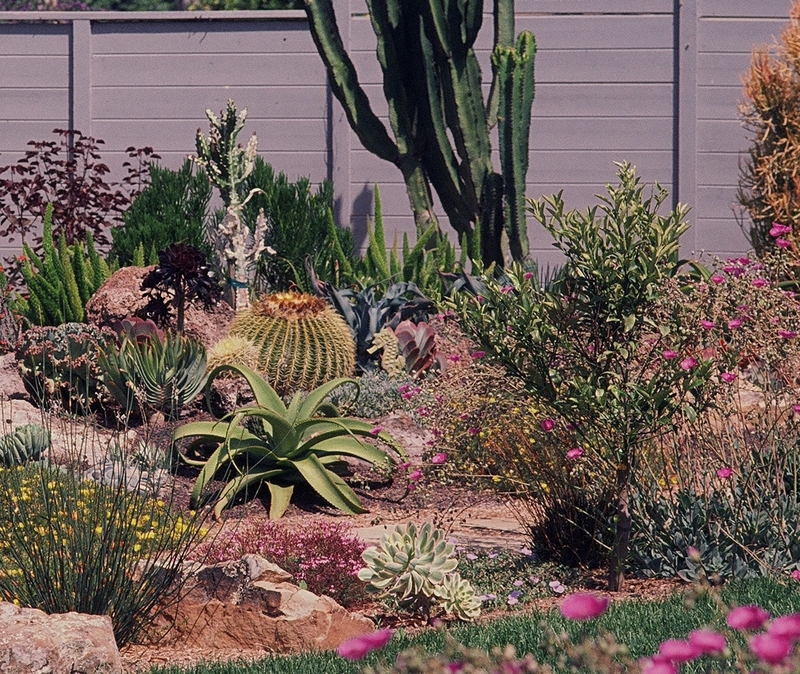 Oasis Water Efficient Gardens in Escondido offer an exciting range of succulents, cacti and other low water landscape plants. 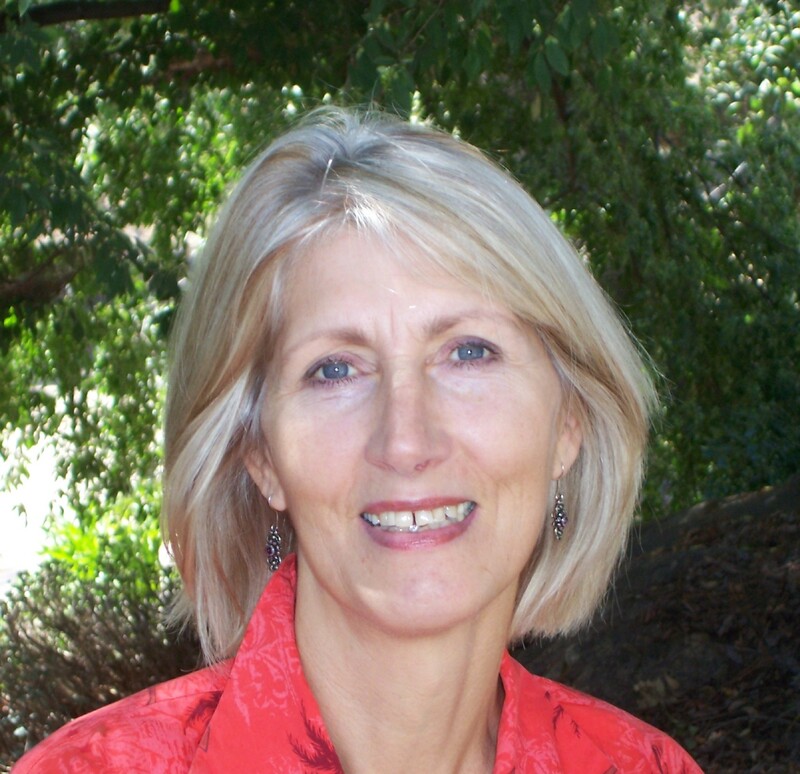 Great photos, ideas and tips for designing with succulents are presented by renowned author and photo journalist Debra Lee Baldwin, Her book ‘Designing with Succulents’ has been a wonderful resource in my design work, and I look forward to her next book, ‘Succulent Container Gardens’ that will appear shortly.